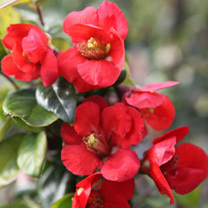 Chaenomeles × superba 'Fascination' (Flowering Quince), a shrub that will work to brighten your garden before most other plants are still getting out of bed from their winter sleep. The bowl shaped orange-red flowers will appear on the bare stems. It’ll help attract those pollinating insects to your garden. The flowers are followed by green fruits that turn golden yellow in the late autumn. Flowers March-May. Height 90-100cm. Supplied in a 3-4 litre pot.